Even though we love the look of Neo (when you can tweak it to be exactly how you want, how can you not? ), there are things about it that we don’t care for. For example, Neo uses the sliding panels layout that is typical of Enyo apps, but one would not know this unless told or accidentally stumbling on that feature; there is simply no indicator (be it dots along the bottom or an edge of the next panel peaking in from the side). Upon first examination of Neo would appear that the whole app is one panel - your timeline - not multiple sliding panels. Another thing that really stands out is that this app seems to waste a lot of screen real estate. Yes, everything is easy to read and big buttons abound, but with a tablet that has nearly ten inches of screen to work with it would be nice to see more than a single timeline at a time on the screen. Last, but certainly not least, is the very odd placement of the menu. 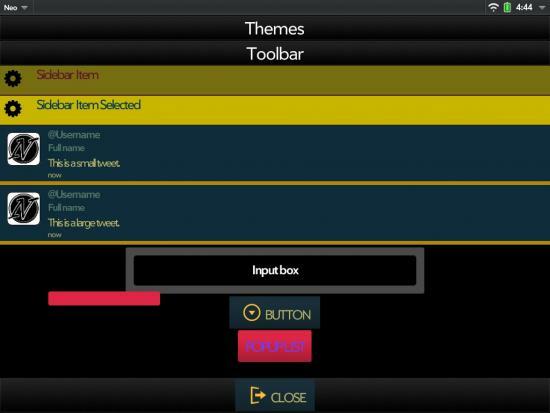 As mentioned in our preview, this app’s menu is found at the bottom of the left panel instead of the upper left corner where 99% of other webOS apps' menus are located. There’s nothing wrong with the menus found in Neo, but we must say it is very “un-webOS” and a bit jarring when bouncing between apps. 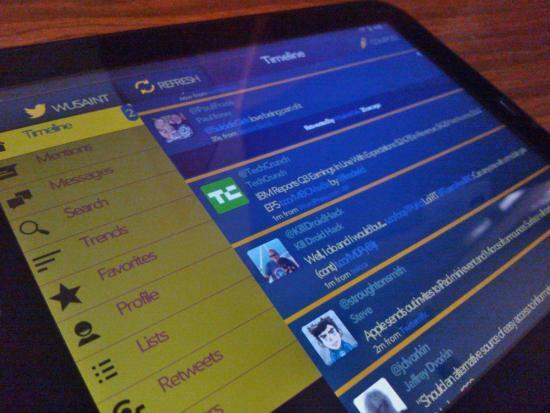 As far as features go, Neo is a full fledged Twitter client and does not skimp in the features department. From Lists to Trends, everything the average Twitter user will need can be found. One really cool feature we like is being able to see Retweets “of me, by me, and to me” which all have their own buttons. It’s not something we would see ourselves using all the time (except for Derek, because he's insecure that not enough people are retweeting what he's posted) but it is still cool all the same. Twitter apps live and die by performance. An app can be drop dead gorgeous but perform poorly and it will ruin the whole experience. Neo is usable from a performance aspect, but definitely leaves a lot to be desired. Several things like switching accounts, switching timelines, opening up the settings menu, and even “pull to refresh” are laggy and sometimes downright aggravating. Even Neo's most touted feature - its extreme customization - is a painful experience because it is so slow to respond in the theme tweaking portion of the app. It proved to be an exercise of patience just to tweak the app enough for the image above. In a nutshell, this app could use some serious work in the performance optimization department. We are hopeful this will be improved in future iterations of Neo, but for now we were disappointed in this app’s performance. In the end, Neo is a good app concept that could be great with a little work. 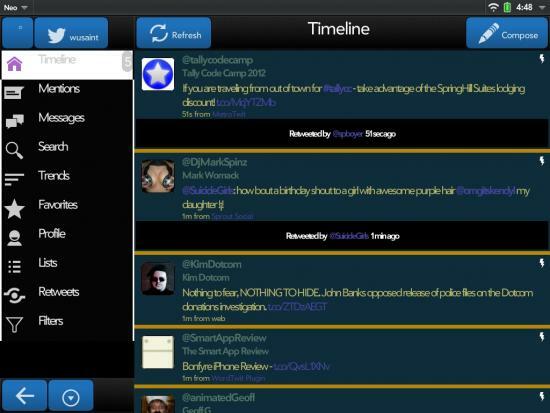 If the rough edges can be ironed out it, would stand towards the front of the webOS Twitter apps pack, but in the meantime it falls short in some areas that most people would consider to be an integral part of a good Twitter experience. That said, if you’re looking for a Twitter experience that you can tweak out and call your own, then Neo is the app for you. At $2.99, Neo could be a bit of a gamble on the hopes that it will be improved with future updates, though we have a hunch things will get better. Besides, its not like the App Catalog has been overflowing these days with Twitter apps.